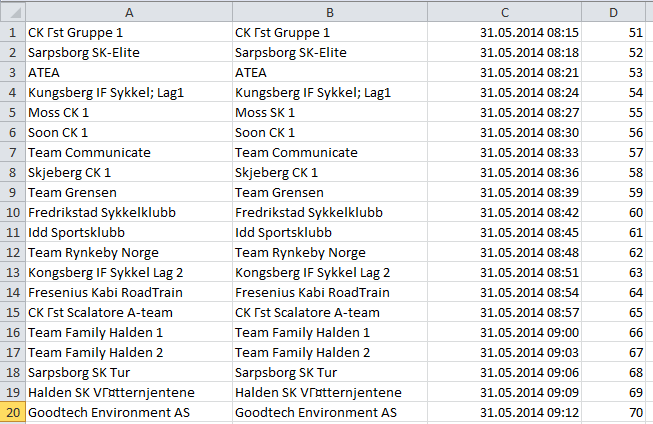 Here is an example CSV layout for the startlist. You can download it here. Column C - Start time for the competitor in the following format (2014-05-31 08:57:00). Make sure this column is formatted as Text. Important: Make sure you are using ';' (semicolon) as a separator when you are exporting to CSV. Read this article if you are unsure how to do this. You go to the Competitor Managment for the wanted event and click the Import button. There you will be prompted to select the CSV file. After you select the file you will view a page where you can review the competitors before you import the. You can delete the ones you don't need, or add additional ones by clicking Add Competitor.